We're seeking an experienced, high-energy Sous Chef to lead a local restaurant. Are you someone who enjoys working with people and providing exceptional customer service experiences in a fast-paced, high-volume restaurant environment? Are you looking to be a part of a team where you'll have an impact, make decisions that matter, and earn big rewards? As a Sous Chef, all of this is possible. I love helping people find their dream job. Brett Rainwater joined Goodwin Recruiting in June 2018. 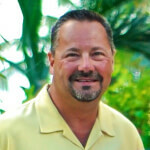 Brett is from La Jolla, California and grew up in the family restaurant business. He spent 15 years with Famous Dave’s of America in multiple positions and over 40 years total within the industry. Brett loves to work out and vacation with the family. He is active in local community projects and owns an Olive Oil/Balsamic business with his wife.